Where was I last Saturday night? Not out eating or clubbing or partying, but something much more exciting – meeting Dorie Greenspan at Sur La Table! Dorie was on the last stop of her cross-country tour to promote her Baking book; once she let me know she would be in town, I could hardly wait to meet someone who’s been so inspirational to my baking. In person, Dorie is as charming and warm as you would expect her to be. Upon learning who I was, she gave me a huge hug and exclaimed how thrilled she was that I showed up. Mind you, there were dozens of eager fans waiting to get their cookbooks signed, and many members of the professional pastry community, doubtless good friends of Dorie, also in attendance. That she would remember someone with whom she’d exchanged just a few e-mails is a testament to her wonderful personality. I told Dorie that her new book was a huge hit in the blogosphere and that new posts about her recipes were showing up every day. She replied that she was thrilled so many people were making and enjoying her recipes. So for all of you bloggers who have been writing about Dorie and her book, she is completely delighted by your enthusiasm! I found it very heartwarming that this author who has written so many cookbooks and received so many awards, can still be so happy to know that "regular people" out there are baking from her books! 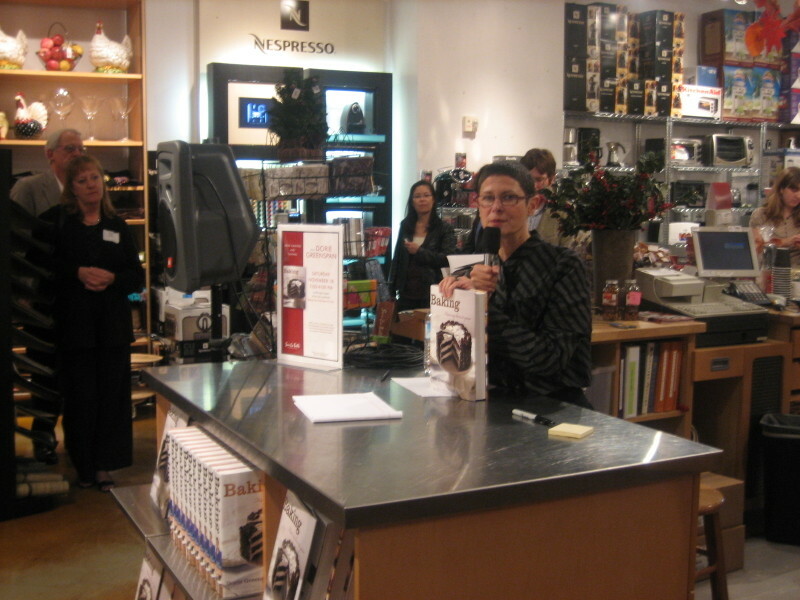 After signing her books, Dorie also answered some questions from the audience, and told some charming stories about working with Julia Child and Pierre Hermé. Did you know that Dorie initially turned down the offer to write Baking with Julia , but (fortunately for us) changed her mind? Dorie recounted the time Julia called her up and told her that they should both get their hands on those new-fangled bread machines and test them out; Dorie recalled this as just one example of Julia’s insatiable curiosity and passion for life. As for monsieur Hermé, Dorie remembers her work with him as an incredible learning experience. I was amused to learn that most of the work for their first collaboration, Desserts by Pierre Herme , was done on a windswept beach in Portugal. Pierre invited Dorie and her husband on a sort of working vacation, and told them they would all be staying in a fisherman’s shack by the sea. Dorie assumed he was being modest about the shack bit, but it turned out he was not. Hmm…hanging out on a beach with Pierre, getting to go through all of his recipes and have him explain his inspirations to you? I guess I wouldn’t mind the accommodations if I got to do that! So now that I’ve finally met Dorie, I’ve come away only more excited to bake from her books, knowing the great person behind them. If you haven’t got your hands on a copy of her new one, I would strongly recommend it – it’s a wonderful compendium of recipes for every baking mood that strikes you, from cookies to puddings to tarts to cakes. There’s also a great selection of holiday pies, if you’re bringing dessert to Thanksgiving! I’ll end with an early wish of a Happy Thanksgiving to all! I am delighted to know that Dorie is as wonderful in person as she is in her books. I love her waffle book and was truely one of the lucky ones to get a free copy of the newest Baking. I’ve enjoyed many recipes from it. Thanks so much for a great write up here. Very interesting, thanks for your report, she does sound like the friendliest lady ever! You are so lucky. She came through here and I missed her because of being sick. We do very much love her latest cookbook, though I love all of hers! It must have been so exciting to meet her in person, she sounds so nice. I am glad to know she is as delightful in real life as she appears in her writing. Just the way she writes is inviting to just dive in. Cool baby, ver cool! What a great entry, I would love to meet Dorie! Lucky you to meet Dorie! She sounds so sweet and, of course, I’m glad you communicated what a hit this last book is in the bloggersphere! What other recipes have you tried? That’s fantastic! I’m thrilled that you got to meet her and as lucky as you were to meet her she was just as lucky to meet you! Here’s hoping she comes to Canada! Ah, shoot, I was in SF and I had no idea! fantastic! you’ve met one of the greatest bakers…i envy you! i’ve always enjoy her recipes too. Wow Anita, I’m thrilled you met her in person – thank you for the great write-up! Thanks so much for all of your kind commments. You were lucky indeed to get a free copy of the hottest cookbook around! She is a great person – really charming and classy! Hopefully she’ll do another tour. I know she’d love to meet all the the other bloggers who are loving her book! She was a very nice and genuine person, I have no doubt you would have loved her too! I know! It was kind of surreal to meet her after adoring her books for years – but she’s just like how she comes across in her books! Thanks! I’m sure you’ll love her other books just as much! I’m not sure when she’s touring again – but if she is I’ll definitely put the information up! I’ve been so tempted by so many of the recipes – so far I’ve only done the World Peace Cookies and Black and White Cake – I’ve made a lot more recipes from her other books. Some of the other bloggers have been going through this new book much faster than me! The event was not very widely publicized – I was kind of surprised I had to dig through the Sur La Table website to find it. Maybe next time! I felt very lucky to meet her! But you should know she’s very appreciative of all of use home bakers! It was a great story – and she was so humble about it! I would have been in shock if Pierre Herme invited me to vacation!! Thank you! It was a thrill to meet her. By the way, I got hold of some Amai tea sweets recently – I really love the photos you took for their site! Cheap codeine and foreign pharmacies. Codeine. Side effects of codeine. Guaifenesin codeine.